Before writing this blog, I did a lot of “research” on algae and algaecides. I use the term loosely because I’m not sure if I were researching or just reading. Whatever it was, though, I did a lot of it. I found myself on popular pool forums (you know which ones) where different home owners and pool professionals recommended different dosages for different pools, using different chemicals. 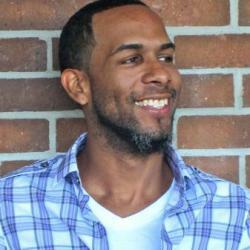 It was a hodgepodge of great information that meant absolutely nothing to me. I can only imagine how a first-time pool owner feels entering the forum for the first time. It is very difficult to prescribe a chemical regime that works for every pool. There are just too many variables that play a role in treating your pool for algae. Even the smallest detail like, what area in the country you live, plays a role in selecting an algaecide. It just so happens that some areas in the country use different brands of chemicals to reach the same goal, a clear, beautiful swimming pool. So, let’s start at the beginning. What is algae? Algae are living aquatic creatures, or simple plants. Photosynthesis enables them to grow very quickly. There are thousands of different types of algae, ranging in colors from green, mustard, and black. Algae blooms seems to peak during spring and early fall. Higher temperatures during the summer time often results in an imbalanced pool. The combination of both the weather and inconsistent sanitation levels, makes swimming pools easy harvesting areas for algae. In early bloom, algae are microscopic in size, making it invisible to the naked eye. It literally takes millions of algae to accumulate before it’s noticed by pool owners. 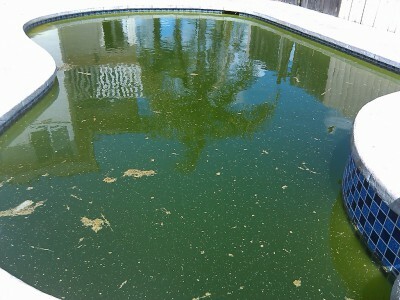 By the time you actually see the algae in your pool, it has already grown quite a bit. Prevention is the best way to eliminate algae is . However, that’s always easier said than done. Keeping all this in mind, I consulted with our technical reps to address how algae can both be prevented or treated, if necessary. If you don’t know how algae grew in your pool in the first place, how are you expected to prevent it from occurring again? It’s simple- you can’t. 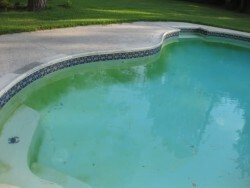 Let’s explore the various ways algae can infest your swimming pool. Imbalanced Water– a pool that is not balanced properly is sure to give you problems- not just with algae. Nutrient pollution– an overabundance of plant nutrients (nitrogen and phosphorous) can cause algae to bloom quickly. These elements may enter waterways via: industrial treatment plant discharge, septic tanks, storm water runoffs, and from nutrient-enriched rainfall. Warm temperatures– hot weather + an imbalanced pool= recipe for disaster. Wind, rain, and contaminated swimsuits– contaminated swimsuits, you say? I did. 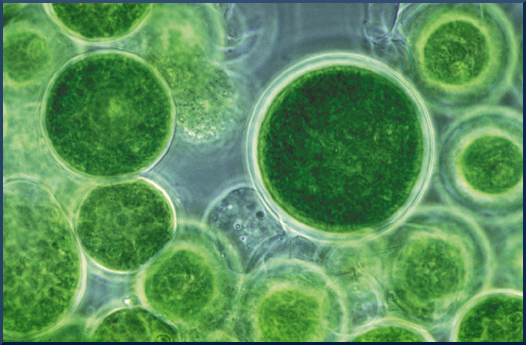 There are thousands of different microscopic algae in the ocean. Whenever you take a dip at the beach, you’re bound to bring home algae particles in your hair and on your swimming trunks. It’s highly recommended that you wash your swimming trunks and shower before hopping in the pool. Poor circulation/filtering– poor circulation can have negative effects on your entire pool, not just algae levels. The best way to fight algae is through prevention. Hopefully you discover this blog before algae inhabits your pool, but if not, keep reading. We also offer treatments further down. It usually requires a person who is comfortable with routine to maintain a proper handle on algae before it becomes an issue. Don’t forget, once you actually see algae in the pool, you’ve already fallen behind. This section is for pool owners who have no problem with algae blooms and would like to keep it that way. Here’s a short, but important check list of things to monitor routinely. Proper circulation and filtration system. A working circulation system is considered one of the most important ways to keep algae away. Make sure you inspect your skimmer and pump strainer baskets. Also make sure your filter element is clean at all times and you’re running your filter long enough to filter your whole pool. Proper chemical balance. Microscopic algae spores are bound to get into your pool. There’s just no stopping it. Those spores, though, can easily grow and cling to your pool walls without proper sanitation. Pay special attention to your pH and chlorine levels. We also recommend you shock your pool routinely. Proper sanitation levels should help eliminate any potential algae growth. Overall cleanliness. It’s not okay for you only to keep your chemical levels steady and not make sure the rest of your pool is just as maintained. Vacuum your pool routinely. This includes regular brushing of pool walls and steps. Brushing helps disrupt any algae bloom unseen by the eye. Be sure to watch for the occasional algae in the tile grout or even your water features. By the time you realize what that green stuff is in your pool, it’s already too late. Algae have reared it’s ugly green head. If algae already have become an uninvited guest in your swimming pool, adopt an algaecide treatment that will fight against current and potential algae bloom. Algaecides are a biocide used to treat algae growth. To combat algae successfully, treatments must be thorough and consistent. As mentioned before, it is almost impossible to prescribe one treatment that works for every single pool. As a result, we’ve broken up treatment into three categories: low, medium, and high algae bloom. Algaecides are chemicals that fight algae bloom. There are several kinds of algaecides out there for you to use. As mentioned before, you may not be familiar with the chemical brand we may be using. That is okay. The regiments within the treatment are more important than the brand of the algaecide you use. The algaecides we recommend are those we are most familiar with ourselves. Low algae bloom is the very beginning stages of an algae outbreak. You may still be able to see the bottom of your pool, but you notice the tint to your water is starting to change to a greenish color. Take any change of tint in your pool water as a distress signal from your pool. It is an early indication of something bad to come if left untreated. Balance your chemical levels. Pay close attention to the pH, chlorine, and alkalinity levels. Clean your filter and pool. Brush your pool walls before adding your algaecide. Add your Algaecide- Terminator (30% Poly). Use bottle information for proper dosage. Keep your pool circulating for 12-24 hours. Check your chlorine levels again. Should be 3-4 range. Adjust levels if necessary. Scrub your pool walls and areas infested with algae with pool brush. Clean/backwash your filter again. Pay close attention to your psi. Repeat until you no longer see a green tint. If there is no visible green tint, but the water is cloudy, use a water clarifier. We recommend the Natural Chemistry Clear Clarifier. Once your pool is at least half occupied with some presence of algae, but it’s not quite as bad where you can’t see your pool floor, I’d say you have a medium algae bloom. In many cases, low and medium algae bloom have similar treatments except medium bloom may require more repetitions. Add your Algaecide-Algaecide Prevent 60 Low Foam. Use bottle information for proper dosage. Check your chlorine levels again. Should be 3-4 range. Adjust any levels if necessary. If your pool is so full of algae that you cannot see the bottom of your pool, then you’re definitely in the full algae bloom stage. By this time, none of your kids want to get in the pool so you have no choice but to begin a treatment. In this particular stage, you will need a stronger treatment than what you would have used during the prior stages. You will need to spend more hours scrubbing your pool walls, a lot more shocking, and definitely a lot more cleaning of your filter. Balance your chemical levels. Pay close attention to your pH, chlorine, and alkalinity levels. Clean your filter and pool. If you have a cartridge or D.E filter, make sure you properly clean the grids. Add your Algaecide- Eliminator (7.41% Copper)– Use bottle information for proper dosage. Vacuum your pool. 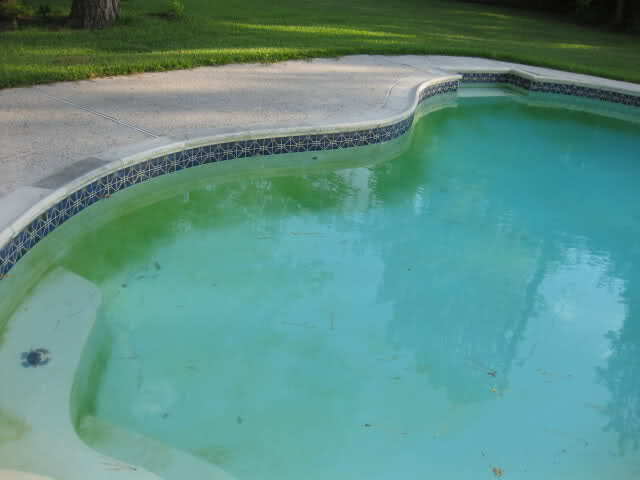 There may be large amount of dead algae that amounts on the pool floor. Algae in your swimming pool is pretty common. For some pool owners though, it is a consistent issue. Unfortunately algae doesn’t disappear as fast as it appears. Throwing an algaecide in your water without proper cleaning won’t get the job done either. Getting rid of algae, although daunting, can easily be done through consistent treatment and cleaning. Repeat steps as necessary until your pool is crystal clear. Once the algae is completely removed from your pool, make sure you follow a routine that will fight against algae, especially during months with higher temperatures.